Good day, everybody! I hope you’re all doing well and enjoying these final days of August! 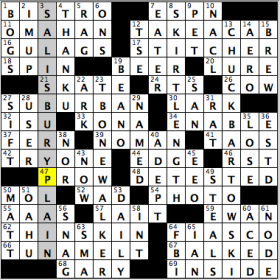 Today’s crossword puzzle has a lot of meat on it…really, it does! In each of the longest theme entries, all going down, the first word of the two-word entries is also a word used to describe a type of steak. OK, this has made me hungry, even though I’m not the biggest fan of the first type of “steak” that’s in the grid, at least going from left to right. CHUCK BARTKOWSKI (13D: [Title character of an NBC show — and one of TV’s best nerds, per UGO.com]) – Though I heard a lot of about the show Chuck, never got a chance to watch a full episode. If you’re looking for a cold one to go with all the steaks, this grid has the suds available for you with both BEER (19A: [Tavern order]) and BREW (15D: [Make coffee]). OK, I know “brew” is a little bit of a stretch, given its context in the clue, but maybe KONA is more down your alley when it comes to coffee (33A: [Coffee from Hawaii]). 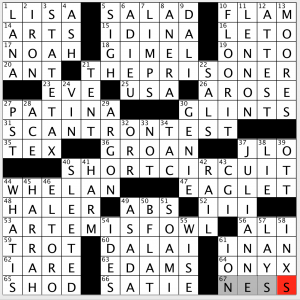 Though I don’t really need to brush up on my Alanis Morissette too much, I initially put in “thanks” instead of THANK U, a product of not reading the clue and assuming that the former had to be the answer (4D: [1998 Alanis Morissette hit]). Easily correctible, but still slowed me a bit. Some love for Indiana State in the grid with ISU, as, normally, the school in Ames, Iowa (Iowa State Univ.) would be the school associated with that entry (32A: [Terre Haute sch.]). Oh, there’s more Hoosier State love, of sorts, with GARY (68A: [Sinise’s favorite Indiana city?]). Probably my favorite entry in the grid was THIN SKIN, something I am not because I am too busy being self-deprecating about 90 percent of the time (62A: [Trait of an insecure, intolerant person]). “Sports will make you smarter” moment of the day: BEANO (35A: [Game of chance]) – While growing up as an impressionable sports nerd, I was always mesmerized every time I got to see BEANO Cook, the late ESPN college football commentator and historian, on television dropping historical knowledge like raindrops. After stints in television in New York and Pittsburgh, Cook joined ESPN as a college football commentator in 1986, and is best known for his work at the “Worldwide Leader in Sports.” Cook passed away in 2012. Thank you so much for your time once again! Have a great rest of your Tuesday and, as always, keep solving!! Last week’s Tuesday WSJ puzzle was somewhat similar in that each of the theme entries is a common response or ending to the same prompt. What made me like this puzzle much more than last week’s was that this one had a relevant revealer to tie it all together and give a reason for the theme entries. If it’d just been four argument deflections, I’d have enjoyed the puzzle much less. I really appreciated that the fill was super clean, aside from maybe the partial AAND and the tough-for-a-Tuesday A FORTIORI. [Scanty skirt] for MINI felt judgmental, but that’s just my take. #includemorewomen: Which women do we have represented in the puzzle today? [Beethoven dedicatee] ELISE, [Ferdinand’s shoe-loving first lady] IMELDA Marcos, LENA [Headey of “Game of Thrones”], 1/3 of [The Band Perry], and an interesting cluing of D’OH via daughter Lisa Simpson. Most important to me, though, is who wrote the puzzle – a byline by two women made my day and made me all that more excited to dive into the solve. Interestingly, though I can’t find any trace of either author via Google, xwordinfo.com or this site, aside from reference to one attorney and one fictional character, so I’m a tad worried that they’re aliases. My fingers are crossed that this is a debut puzzle instead – does anyone have any info on either author? I’d love for it to actually be two women with a debut puzzle that we can celebrate! (If it turns out to be one or more male constructors using female pseudonyms, I’ll be substantially less thrilled though curious as to why they felt the need to use female pseudonyms.) Either way, I’d love to get to the bottom of this – help me out, Fiend friends! BACK CHANNEL is the revealer, clued as 60a. [Covert means of communication … or what’s hiding in the circled letters?]. 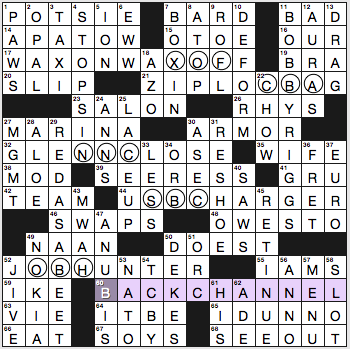 The other five themers are familiar(ish) phrases with 3-letter TV channels spelled backwards in the circled squares. 21a. [Resealable container for chips or cheese], ZIPLOC BAG. Trade name. ABC hiding. 32a. [Portrayer of Cruella de Vil in 1996’s “101 Dalmatians”], GLENN CLOSE. CNN hiding. 44a. [Connection point for a smartphone cable], USB CHARGER. CBS. 52a. [One using Monster.com], JOB HUNTER. HBO. The theme works for me, and I like the grab bag of theme entries. The fill seemed mighty rough for a Tuesday puzzle, though. Starting with POTSIE and progressing through OTOE, RHYS, weird plural SOYS, AZO, DEKES, ORB/ORC, and RESHOE (do people generally all know what a farrier does?). Remember when three solid themers and a revealer were deemed good enough? The fill would likely be better with fewer theme squares in the grid. 23a. [Place to get a perm], SALON. Oh my god. Again? Still? Men of crosswords, stop putting “perm” in the SALON clues. This was absolutely an accurate clue back when The Karate Kid came out, but it’s been awhile since salons were doing a lot of perms. 54d. [Soft-serve chain], TCBY. I use soft-serve specifically for the ice cream/ice milk product, and not for frozen yogurt. Something like Dairy Queen works better for this clue. And for what it’s worth, the TCBY site tells me they currently have hand-scooped, non-spirally-extruded frozen yogurt, too! 11d. [Loser of tennis’s Battle of the Sexes], BOBBY RIGGS. More famous for this than for anything he ever won. 5d. [B+, e.g. ], ION. Tricky clue! I was thinking letter grades and blood types not boron ions. 21A [Show with a protagonist known as Number Six] THE PRISONER – Never heard of it! The original was from the 60s. 31A [Where to use a No. 2 pencil] SCANTRON TEST – If only they had the plethora of mechanical pencils available today when I was in elementary school! 40A [Movie with a robot called “Number 5”] SHORT CIRCUIT – I have never seen this movie. What a surprise! 53A [YA fantasy hero who combats No. 1] ARTEMIS FOWL – I’ll have to ask my son about these books. Not familiar with them at all. Can you think of any more? I think there was a Number One on the Get Smart TV show, and there was a movie I am Number Four, but neither of those necessarily lead as smoothly to a grid entry like Matt did it here. Curious as to what was on the “cutting room floor” for this one! A solid 4.3 stars today. 5A [Waldorf (but not Statler), for one] SALAD – A Muppet clue! I am in a quandary: I love the Muppets; I grew up with them. But I am not a Disney fan, and Disney … owns … the Muppets. And Marvel. And ESPN. And ABC. And everything else, it seems! 61A [“__ Artist’s Studio” (Christina Rossetti poem)] IN AN – You can find the poem here. I am highly uncultured, so this is a new one for me. 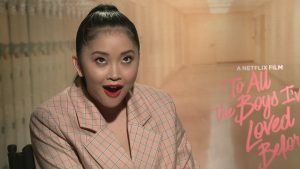 1D [Actress Condor of Netflix’s “To All the Boys I’ve Loved Before”] LANA – The obscure pop culture reference of the week! Sometimes when I Google these people I recognize them. Not this time! 24D [Diesel who got to say “I am Groot” in multiple languages] VIN – I forgot he provided this voice in the Guardians movies. I am not sure I understand the clue; I’ll have to rewatch them! 44D [Start of many a “Jeopardy!” response] WHAT IS … – A great entry. Maybe because I am a fan of the show! 45D [Palindromic Reno casino founder William] HARRAH – I still have not been to Vegas, but I am going to plan the trip soon! It seems as if there are a lot of bylines in recent weeks that I have never heard of. Joe Deeney is another one. Totally new name to me, but, as is pretty much always the case with these strangers, the puzzle is very good. Ever been fishing? Then you can relate to this theme! 55A [Phrase including hand gestures symbolized by the puzzle circles] IT WAS THIS BIG! Fishing is known for the tall tales told among its practitioners. The only other activity I can think of that is known among amateurs for excuses is bowling! “I need new shoes!” “I need my ball redrilled!” “The lane is too dry!” “A pin was out of place!” I can go on and on. And I have used many of these. I like how this “fish” gets bigger throughout the puzzle. Very clever! 4.4 stars from me. 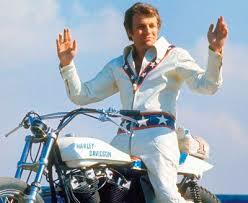 23A [Stuntman Knievel] EVEL – I had forgotten he passed away, but he has been dead since 2007. I recently heard on morning radio show, when the topic was Travis Pastrana doing similar stunts, that he was a real jerk in his private life. But I guess you have to be a little crazy to try the stunts he did! He is still very crossword famous! 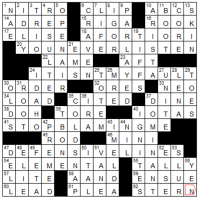 36A [Herb in Italian seasoning] OREGANO – Is this arguably the most popular crossword herb? I don’t know why I highlighted this entry; I think I am just hungry! 58A [Russian ballet company, familiarly] THE BOLSHOI – This seems odd to read as a phrase, but I think this is how it’s referred to commonly. At least there is no need to put a “with ‘the'” tag in the clue! 63A [Mario __: Nintendo racing game series] KART – My 6-year-old is just now discovering video games. Like his father, he is terrible at them! 42D [“A Time to Kill” novelist John] GRISHAM – I used to read every book he cranked out, but I haven’t been much of a reader in recent years. I dearly miss reading. 47D [Actor Mahershala of Netflix’s “Luke Cage”] ALI – Also in the new season of True Detective on HBO. Season 1 was great; didn’t finish Season 2 of this. 53D [Canon competitor] NIKON – I keep saying I am going to get an SLR camera, but I still don’t have one. One of these days! This entry was posted in Daily Puzzles and tagged Brian Thomas, Elizabeth C. Gorski, Joe Deeney, Martha Jones, Matt Jones, Wendy L. Brandes. Bookmark the permalink. Hello! My mother wrote this puzzle. She absolutely is a woman and a very smart and talented one at that! As a teach, family counselor and scholar, she has a passion for language and puzzles. You will be seeing much more from her I guarantee! That’s great to hear! Is this her debut then? If so, please congratulate her for us! This is a superior puzzle. I hope these two very smart ladies continue to write such clever, thoughtful and stimulating puzzles! And were never out here in rural Central Texas. I have several friends who get a new perm at the salon every three or four months. Excellent WSJ! I hope to see more from these constructors. I liked Matt Jones’s clue for 21D. I enjoy clues that reveal something about the constructor, and I can definitely relate. Definitely some unusual fill in the WSJ, such as the legal term and the short version of nitroglycerin. I was actually tempted, apart from the British spelling, by NITRE (since a crossing ruled out NITER), which can mean a chemical in gunpowder. But I reminded myself that these would be welcome later in the week, and it’s hardly the setters’ decision to run it on a Tuesday. Enjoyed today’s NYT with the exception of SEERESS, which feels forced and sexist. Also, duplication with 68a SEE OUT. I can further verify that today’s WSJ puzzle constructors are women — and also that they’ve worked long and hard to reach this point! More than 10 years ago, I donated the writing of a custom-made crossword to a fund-raising auction at my daughter’s high school. One of today’s authors, Wendy Brandes, was the winner. 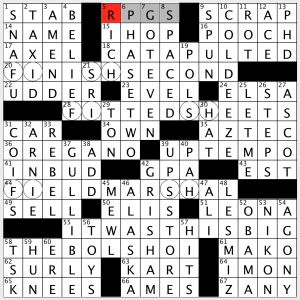 Years later, in 2015, Wendy got back in touch, asking if I’d be up for showing her and her fellow crossword-fanatic friend, Martha, how to make a crossword. It would be a birthday gift for Martha. I agreed, but in lieu of payment, I asked them to help spread the word about a self-published graphic novel I was completing. And so we met one night in April at her apartment on the Upper West Side in Manhattan. I heard from Wendy a few times after that, running a few of their ideas and grids by me. And then, finally, Wendy contacted me last week to say a crossword written by Martha and her would be running in the WSJ today! It wasn’t an easy journey, or an overnight success … but they persevered, and I’m sure they’re really enjoying today! It’s a nice puzzle. WSJ 9D is simply wrong–a parlay is not a reinvestment but rather a multi-component bet made up front. Also, I’m not sure it’s accurate to describe any casino activity as an “investment”. I retract my previous comment–I was wrong! The WSJ puzzle had a fun theme—well done! I also liked A Fortiori (being a lawyer)—you don’t see that in the puzzle very often. It was an easy solve, but still fun to do. More from these constructors, please!